Singapore company registration specialist Rikvin is happy to announce the launch of its newsletter, RikvinConnect. In gist, the inaugural issue contains a quick digest of information pertaining to doing business efficiently in Singapore. First of all, it showcases a salient government program, the Productivity and Innovation Credit Scheme (PIC Scheme), which is designed to help enterprises move up the value chain but has yet to gain traction in spite of the benefits it confers. Secondly, the newsletter highlights a vital change in Singapore’s business regulatory environment as well as new features in the Rikvin Learning Center. Last but not least, the newsletter turns the spotlight on an esteemed client. “In the coming months, our subscribers can look forward to more succinct updates about the city state’s business regulatory updates, new services offered by Rikvin and new features on our website. 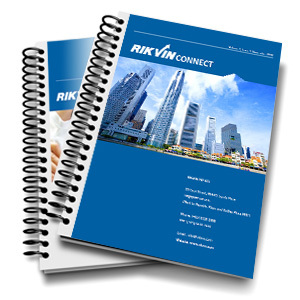 In addition, we welcome our clients and subscribers to tell us what they’d like to see in their upcoming issues of RikvinConnect,” she added. The first issue of RikvinConnect is available for download at https://www.rikvin.com/newsletter/rikvinconnect-november-2012/.